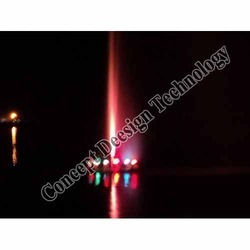 The team of our company helps in developing a wide assortment of floating fountains to our esteemed clients. These are available in the float size of 2 dia and are able to give 3 lights at a time. Our range comprise of foaming jets, fan jets, umbrella, cascades, vertical jets and finger jets. These are easy to maintain and attractive in look. The wide spreading display of the Lily Jet series creates a broad feature that will beautifully fill any lake scene. The all brass display head produces heavier floral sidejets that arch up and out, making it a highly visible. Powered by a U.L. listed heavy-duty submersible turbine pump, the Lily Jet standard equipment includes a complete U.L. listed control panel. All our fountain components are fully waterproof and made of the finest corrosion resistant materials to provide years of dependability and high performance. 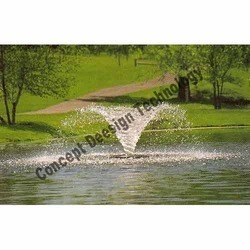 We offer a wide range of floating fountains that provide the much needed aeration for pond or lake. The pump bodies in the fountain provide a base for up to eight easy to change nozzles. These fountains are easy to maintain and can be used in residential as well as commercial buildings. 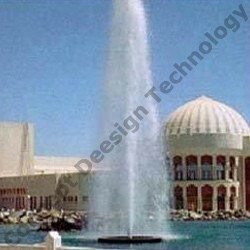 We offer a wide range of Floating Fountains System to our valued clients with the help of our team of designers. This is derived from quality raw materials and sophisticated technology. Our range is available in the float size of 2 diameters and is able to give 3 different type/color of lights at a time. These products include foaming jets, fan jets, umbrella, cascades, vertical jets and finger jets. It is well known for the durability, beautifying and easy to maintain characteristics. 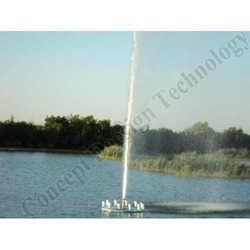 We also provide a qualitative range of Floating Fountains Sprinkler to our clients that offer the essential aeration for pond or lake. Our range is provided with heavy pump bodies that provide a base for up to eight easy to change nozzles. Furthermore, this range is ideal to be used in residential as well as commercial buildings. We also provide customized solution to our clients as per their requirements. No of lights - 6 Nos LED Based lights. 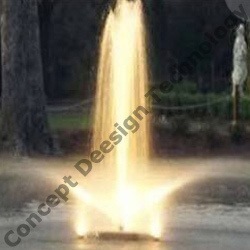 We offer a wide range of Vertical Jet Nozzle to our clients, which is available in the size of 5"x dia 2" and provide amazing look to any vertically raised fountain. Our clients can avail our range with the inlet size of 25mm at most competitive prices. These are highly appreciated by our clients for the smooth functionality, high performance and longer service life features. Moreover, we provide well customized solutions to our clients. 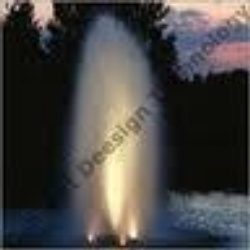 Size : length 5"x dia 2"
Looking for Floating Fountains ?